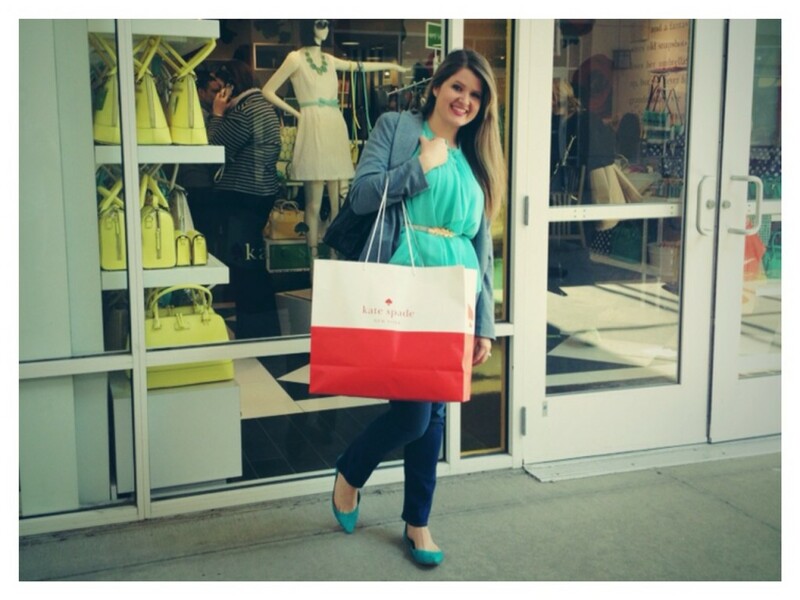 I have been swooning over Kate Spade for awhile. 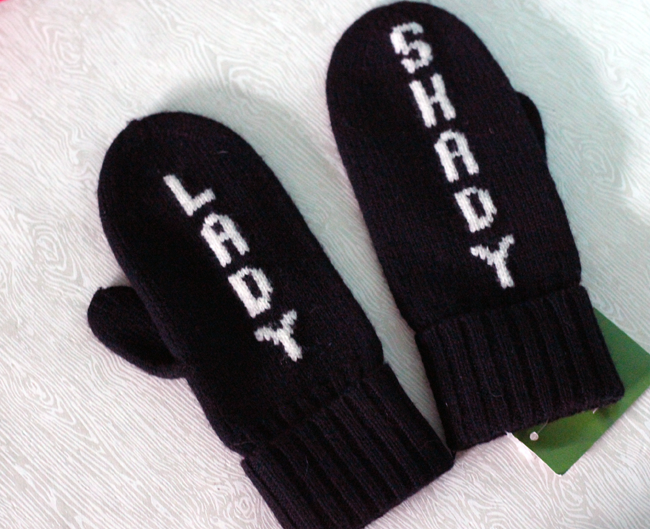 Her designs have a vintage, classic aesthetic while looking perfectly placed in this decade. I love the colors, the textures and pretty much everything aside from the price tag. 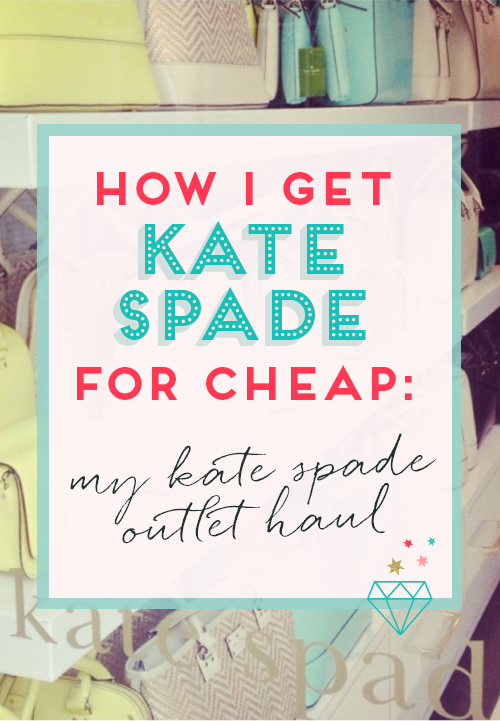 This is exactly why I was so excited to find out that Kate Spade has a chain of outlet stores! If you can’t wait for the next flash sale on Hautelook or Zulily (where I’ve been able to find Coach, Michael Kors) it might be time to head to the outlet! Most of the time, the outlet carries outlet specific pieces, but there’s a clearance section as well. When I went, I shopped the clearance section, which had an additional 20% off during Easter weekend. For the full priced items- the iPhone case and the scarf, you can use a student discount, so be sure to take advantage of it if you’re a student! 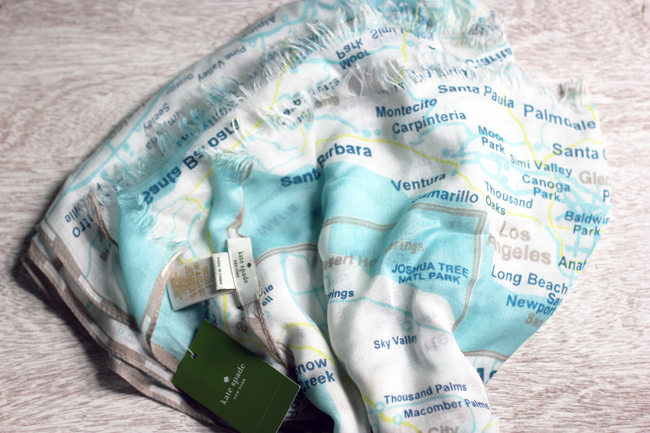 This scarf is my favorite- it’s a map of southern California and I ADORE it. 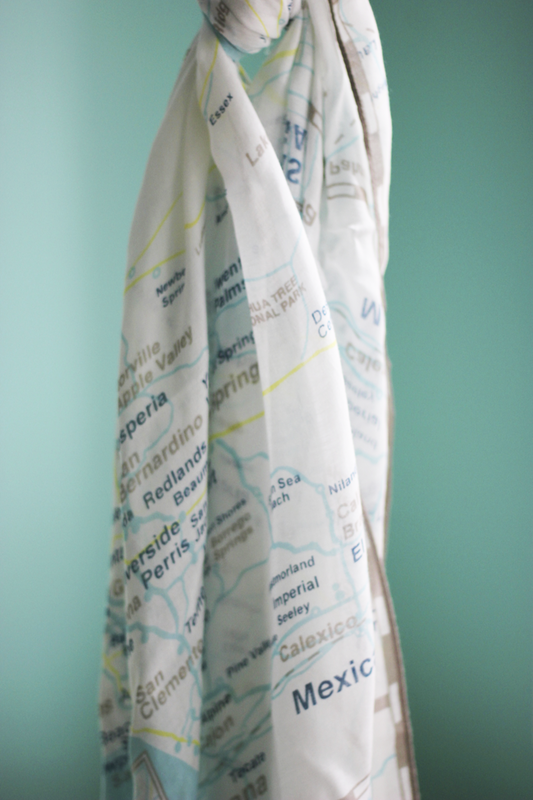 It’s got my old haunts back home, but it doesn’t list my hometown (which is super small). Since we’re getting married in Los Angeles, and it’s a Route 66 theme I am wondering if this would come in handy for our engagement session. So, what was the damage? 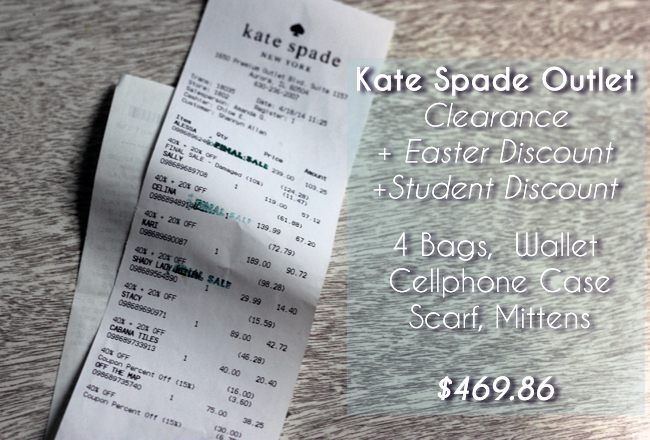 $469.86 for four bags, a wallet, scarf, iPhone case and mittens from Kate Spade. If you’re a student, be sure to bring your student ID or shop on a holiday weekend when there are going to be more sales! I was super happy with our haul. This was my first outlet trip in ages upon ages. Outlet stores are an interesting tactic by brands- sometimes the garments and items aren’t as high quality as their full priced counterparts, but I didn’t find a huge difference in quality with these outlet pieces. You can tell if an item was made specifically for outlet sale since it will say it on the tag or you find full size runs or a hefty inventory of the product. Actual items that are left over from the main stores or lines will be sprinkled in the store (with only a few to choose from) or will have a few markdowns on the tags (like sharpie lines on the tags). Again, I don’t usually notice a huge difference in most lines (aside from the GAP where their Outlet stores sometimes really aren’t that great of a deal) but items like Kate Spade and Betsey Johnson, they’ll make pieces just for outlets and sale stores like TJMaxx and Nordstrom Rack. If you don’t live near an outlet store, you can still get great deals directly from the Kate Spade site during flash sales! Additionally, I’ve snagged great deals on Kate Spade bags, dresses and accessories at HauteLook and Zulily. 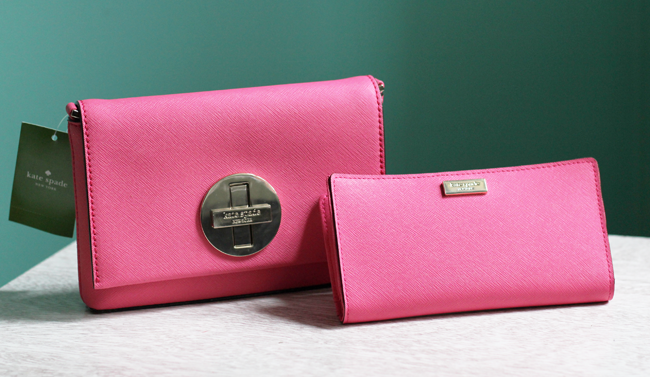 What’s your favorite way to save on luxury items? 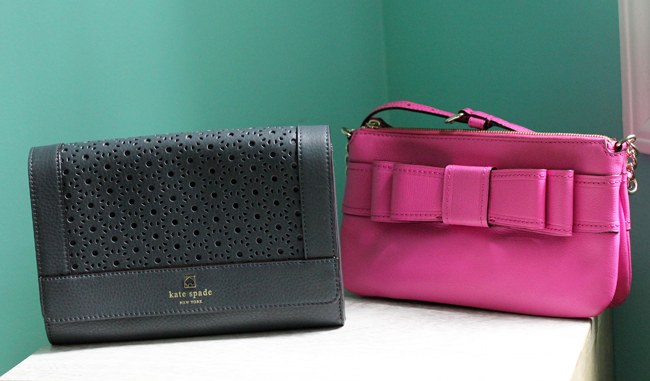 Four Kate Spade purses, plus all the other stuff for under $500? That’s a great deal! Her bags are so classic. I love how they’ll look good for years if you take care of them! OMG. I NEED that scarf! I might have to take a trek over to our outlet this weekend. SoCal is my favorite place on earth! That scarf must become part of my wardrobe! Great haul and pics. I don’t think there’s a Kate Spade outlet around here, but I’ll definitely look just in case they’ve got that scarf! I’m so jealous of your finds! Was this the outlet in Aurora? I went there once and didn’t see much of a clearance section and the prices were crazy high but sounds like you hit it at a good time! That is a crazy-good deal! And I love that scarf. I definitely need to check out the outlet store here. My wife is a huge fan of Kate Spade, she just got one of her purses from Amazon for like $60. I’ll remember this tip next time I’m looking for a good present for her. Your haul looks absolutely beautiful! Awesome deals, you look beautiful! 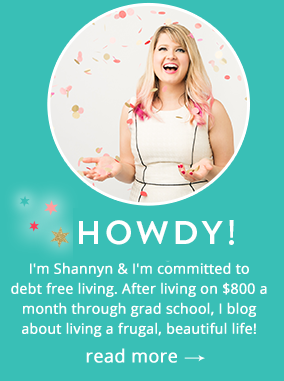 OMG I love all of your purchases – I go to the outlet by my house and it is a blessing!! 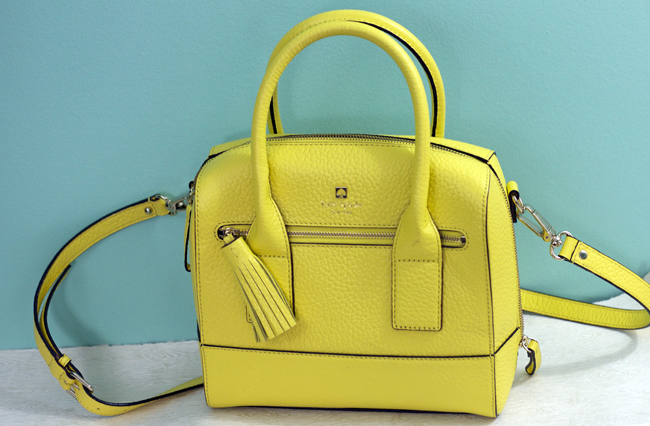 Isn’t Kate Spade just wonderful?? Outlet shopping is the way to go! How do we find the Kate Spade outlet locations?